I am interested in knowing what the following types of navigational aids are called in english. My dictionary isn't of much help. Arholma Båk - What would this type of non-light navigational building be called? Built in 1768. Högskär Kummel - Simply made of piled rocks, whit a corrugated roof. And finally, what is this type of mark called? Moosup, I'm not sure what our official titles would be, but I believe both of the first structures were probably built to serve as daymarks. A daymark is just some landmark that allows ships to navigate by them during the day. Usually in our part of the world the paint scheme on a lighthouse serves as it's daymark. The last one looks like a channel marker equipped with radar reflecting screens. I saw a couple of these in the St. Mary's river a couple years ago. They are designed to allow the ships to see them easily on radar for night navigation, usually in tight river systems. Those are just my guesses, anyone else have an opinion?? Thanks for your answer, Mike. Yes, they serve as daymarks, even if they aren't of the same use these days. I read a swedish translation of the first structure, which in Sweden is called "Båk", was incorrectly translated to "beacon" which I guess is totally wrong. As for the second one, in Sweden called "Kummel", would simply "marker" be a correct translation? Nothing like an international comment here. Way back in the dark ages light were just fires in the top of a stone structure. That was probably what the 2nd photo was. The first one with the suffix "Bak" could possibly be translated as "back" meaning there was a front light somewhere which between the two would be channel markers when aligned gives a safe entry into a port. 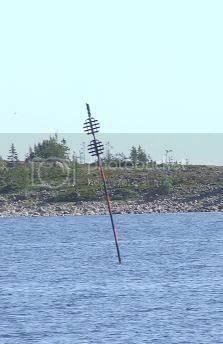 The third photo is a channel marker in my opinion or a danger marker for a pile of submerged rocks, hence the red and black. These things are different down this part of the world. Thanks for answering, Kevin. True, the first lights in history usually were simple fires on top of piles of rock, the marks on the first and second pictures has never served as beacons though, just as daymarks. http://hem.spray.se/ibiz/OLD.html The first open coal light in the link was built in 1849. 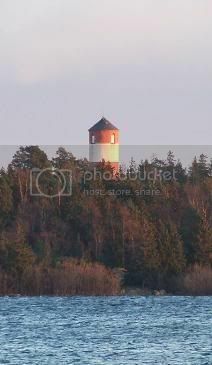 The first picture, Arholma have had serveral purposes during its 239 years in service, besides daymark. 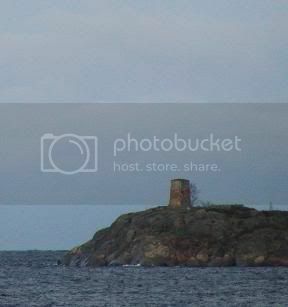 Watchtower for a pilot station, also watch tower for the community of the Island of Arholma, as an optical telegraph and military signal station. It was opened to the public in 1997 and now is a popular attraction for anyone interested in navigational aids.